Sleeving, I think that's a great verb to describe knitting sleeves. Because that's what I am doing; still furnishing this sweater with its sleeves. I have completed the left sleeve. What a triumph it is to have it done. 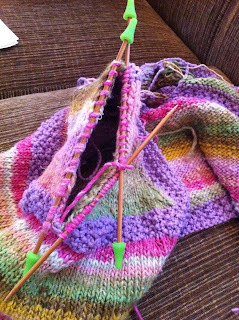 It was the tricky side of the kimono and I was worried that it would end up looking wonky. Wonky it is not. The sleeve knitted up nicely. I am pleased with the color sequence too. I do love this yarn's color spectrum. There is just one partial sleeve to complete and this sweater is finished. Finished! Oh what joy that will be to have a new sweater for little Adelynn. I began it nearly a year ago and am so determined to complete it under a year's time. That's saying a lot. If you would peek into my various working baskets you would see several projects years and years old. I promised myself I would make a serious effort to close out all those unfinished things. Scarves, leg warmers, mittens, hats, doll sweaters, toys, everything lurking in the bottom of those baskets. My problem is I just keep finding such great NEW projects to distract me. I will prevail in spite of myself. I must make a significant effort to liberate those hostage needles and yarn from their unfinished prison. More needles and yarn mean more new things to try. That said I need to finish this sleeving. Then I can move on to figuring out how this sweater is going to fit my petite baby girl. The pattern calls for adding two ties to the front. Simple ties that would be fantastic if my girls were not so slight in body size. My solution is I need to treat this kimono like a kimono and secure the sides in robe like fashion. Ties just won't work very well. Maybe a belt? No. That just sounds unfitting. Buttons I think. Lots of pretty buttons. For those buttons I'll need to cleverly think of placement in relation to function. All good thinks to consider while I continue sleeving.